How to Set ToolBox Standards ? Home » How to Set ToolBox Standards ? By Default ‘ANSI Inch’ standard is set if you have installed DraftSight on Windows English OS. You can click on any other Basic Standard and Activate it. If you want to Copy this or any Standard and Customize it then click on ‘Copy’ tab . on New Custom Standard Name it and Click Ok. Copied Standard will be added in Custom Standard List. Selecting it will highlight all tabs next to it. You can make copy of this new Standard , Delete it , Rename it , Activate it. Tip: Select Check box for ‘No active Standard ‘ if you want to change standard in respective Toolbox Component. 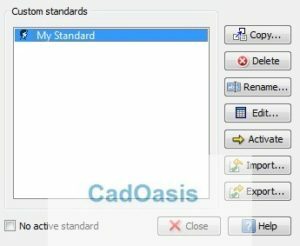 If you select No active standard, the value for Active Standard at the top of the Standards dialog box is set to None. 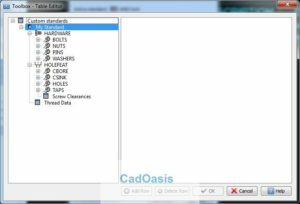 Toolbox – Table Editor will open. You can edit Respective Components of Toolbox for this Custom Standard. 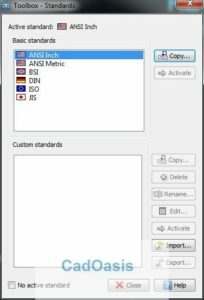 You can also ‘Import’ or ‘Export’ Custom Standards in DraftSight Toolbox. These standards will be used for all Toolbox Components.